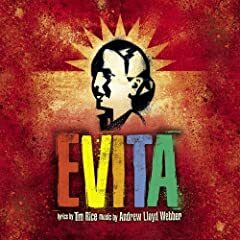 Book and lyrics by Tim Rice, based on the life of Eva Peron, the infamous first lady of Argentina. Music by Andrew Lloyd Webber. The original Broadway production opened on 25 September 1979 and was directed by Harold Prince, with choreography by Larry Fuller, running for 1567 performances. Originally produced as a concept recording, the original West End production opened on 21 June 1978. A film version was released in 1997. At A CINEMA IN BUENOS AIRES (July 26 1952), the manager announces the death of the first lady of Argentina, Eva Peron. The country is thrown into mourning but one man, Ché, sees the Peron government as it really is (REQUIEM FOR EVITA /OH, WHAT A CIRCUS). We are transported back several years to Junin, the small town where Eva grew up. Here, she is far from the glamorous icon she will become, and yearns to leave for the big city. She clamps onto a tango singer, Agustin Magaldi (ON THIS NIGHT OF A THOUSAND STARS / EVA, BEWARE OF THE CITY), and uses him as a means to get to BUENOS AIRES. There she rises in stature, sleeping her way to success as she gets to know the créme of the famous and influential (GOOD NIGHT AND THANK YOU). Meanwhile, the political stability of Argentina is changing rapidly (THE ART OF THE POSSIBLE) and Eva manipulates herself into a meeting with Juan Peron (CHARITY CONCERT / I’D BE SURPRISINGLY GOOD FOR YOU). She goes home with Peron and moves in, licking his 16-year-old mistress out (HELLO AND GOODBYE / ANOTHER SUITCASE IN ANOTHER HALL). Her actions to not go unobserved, however, and she draws criticism from the wealthy aristocracy of Argentina as well as the army (PERON’S LATEST FLAME). Ignoring them, Eva pushes Peron towards taking over the supreme power in the country – he is soon elected the President of the country (A NEW ARGENTINA). ON THE BALCONY OF THE CASA ROSADA, Peron gives his inaugural speech to the people of Argentina. But it is Eva who wins the decamisados over with her moving oration, DON’T CRY FOR ME, ARGENTINA. She establishes a place for herself in the hearts of the people (HIGH FLYING ADORED) and creates an image that she embodies to the full (RAINBOW HIGH). Eva then commences her RAINBOW TOUR to Europe. Although not entirely successful – the first signs of her illness appear, slowing her down somewhat – she returns in triumph to get the English out of Argentina (THE ACTRESS HASN’T LEARNED THE LINES YOU’D LIKE TO HEAR). The myth of ‘Saint’ Eva Peron continues to grow, as she works to promote herself, her husband and the cockeyed kind of democracy she believes in, setting up a charitable Foundation which is more charitable to those who get from it than to those who are forced to contribute. She then proceeds to work with the underprivileged communities of the country, starting a national bankruptcy in the process (AND THE MONEY KEPT ROLLING IN AND OUT). Although the people adore her (SANTA EVITA), Ché is still cynical about her motivations and her actions (WALTZ FOR EVA AND CHE). She finally insists on recognition, on the post of Vice-President, not realizing that there are still barriers against her ambitions, (SHE IS A DIAMOND / DICE ARE ROLLING) but the more pragmatic Peron does not have to face her with a ‘no’, for her last illness is upon her. She collapses and her life flashes before her eyes (EVA’S FINAL BROADCAST / MONTAGE / YOU MUST LOVE ME – added for the film). She realises that this is the end for her, and considers her life in a final LAMENT. When Eva Peron died the people of Argentina were distraught, for like so many who have survived as popular icons to later ages, she did not grow old: she died at the height of her powers. FROM LEFT TO RIGHT: 1. Evita 1976 Concept Cast CD. 2. Evita 1978 London Cast CD. 3. Evita 1979 Broadway Cast CD. 4. Evita 1997 Film Cast. 5. Evita 2006 London Cast CD. FROM LEFT TO RIGHT: 1. Woman Behind the Myth DVD. 2. Evita Film on DVD. 3. Evita Musical Excerpts and Complete Libretto. 4. The Making of Evita (The Film). 5. Evita Vocal Selections. Tonight, in Sacramento, California, Evita is playing at Wells Fargo Californa Music Circus. I LOVE the musical. Andrews works are still THE BEST! I am happy when I hear the song of Madonna, “Dont Cry for me Argentina”. I wish to write in Engish to explain more.